Sometimes bad advice can be given with good intentions. Powell’s advice was prescient in that he foresaw how the emails could create a public-records snafu. 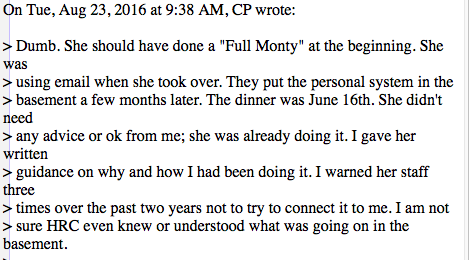 But now he is getting a lesson in the dangers of assuming personal email is secure. If the provenance of the emails is dubious, and reading them seems a bit prurient, some of them sketch an interesting portrait of Powell in late career. Despite an extraordinary record, and frequent references to hobnobbing with other foreign-policy luminaries, the Powell that emerges in the emails is a sort of everyman—the last rational American, maybe. He hates Donald Trump, finds Hillary Clinton bumbling and foolish, sees the Benghazi scandal as generally a farce, and remains angry about the Iraq War. First, we didn’t invade Iraq to bring democracy—but once we overthrew Saddam, we had a view of what should follow. If Don and the Pentagon had done their job (after claiming the rights to lead post-war rebuilding—things might have turned out differently)… Don should just stop talking. He puts his foot in his mouth every time. Powell was similarly skeptical of efforts to turn the September 11, 2012, attacks in Benghazi, Libya, which killed Ambassador Chris Stevens and three other Americans, into a political bludgeon. “Benghazi is a stupid witch hunt. Basic fault falls on a courageous ambassador who thoughts Libyans now love me and I am ok in this very vulnerable place,” he wrote to Rice in December 2015, though he added, “But blame also rests on his leaders and supports back here. [Under Secretary of State] Pat Kennedy, Intel community, DS and yes HRC.” Rice agreed. Despite dismissing that flap, Powell shows himself to have little patience for Hillary Clinton in the email flap, and particularly for her public-relations approach and her small cadre of closely held, extremely loyal aides, willing to go to great lengths to defend her. Over time, however, he seems to have become increasingly annoyed at what he viewed as the Clinton team’s attempts to draw him into the story. A month later, in September 2015, Powell wrote to his former aide Lawrence Wilkerson. “HRC and her mishandling of this has really given her a major problem I do not wish to get involved in, despite the best efforts of her team to drag me in,” Politico reports. I warned her staff three times over the past two years not to try to connect it to me. 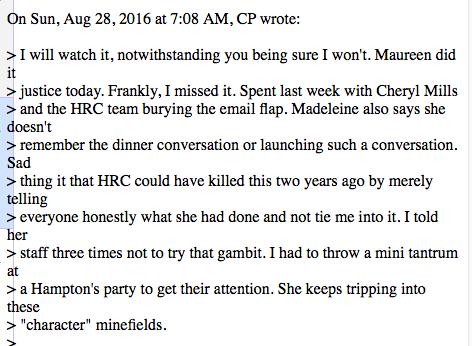 I am not sure HRC even knew or understood what was going on in the basement. Writing to a former aide, Powell condemned the movement that questioned whether Barack Obama was born in the United States. Yup, the whole birther movement was racist. That’s what the 99% believe. When Trump couldn’t keep that up he said he also wanted to see if the certificate noted that he was a Muslim. As I have said before, “What if he was?” Muslims are born as Americans everyday. Repeatedly in the emails, Powell reveals himself as an amateur press critic. In December 2015, for example, he explained to the journalist Fareed Zakaria why he wasn’t speaking out. Certainly that seemed true at the time. But these days, Trump is running much stronger. Though most polls still suggest Clinton has a lead, her advantage has narrowed both nationally and in several swing states. Although he has always been a Republican, Powell crossed over to endorse Democrat Barack Obama in both 2008 and 2012. This year, however, he has not backed a candidate. Nor has Rice. McKay Coppins reports that many Republicans are privately in a state of “panic” about the prospect that Trump might actually win. Behind closed doors on Capitol Hill on Tuesday, congressional Republicans reportedly hammered Trump’s running mate, former Representative Mike Pence, over the campaign’s stances and rhetorics. If Powell comes out of the emails as a sort of everyman, his dilemma over the coming few weeks also mirrors the choice faced by many of those Republicans, from Condoleezza Rice and George W. Bush to members of Congress. Do they back a Democrat who they see as flawed and error-prone, and in many cases with whom they have bad blood? Or do they keep quiet and pray that she’s able to beat a “national disgrace” without their help?